The following words and images are sure to make you cry if you’re a lover of old records, so you may want to stop reading here. Hungarian designer Zachary Tipton of Tipton Eyeworks was looking for an interesting new material for his designer frames – and inspiration struck when he happened upon his father’s old collection of records. After salvaging tons of old records from Budapest flea markets, Tipton and his company explored how to make them into frames. Vinyl is already very durable, but it is susceptible to heat. The team fused the vinyl with biodegradable cellulose-acetate, creating an extremely tough and long-lasting frame material. The Vinylize collection of frames still has marks of the material’s former life: the vinyl still sports the grooves that once played music. 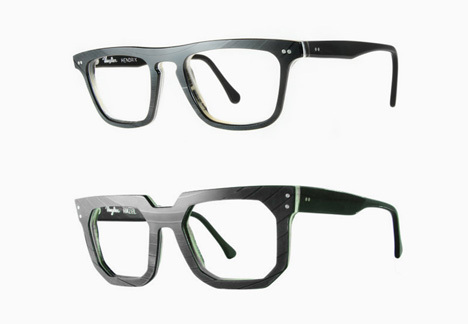 A proprietary process has made the handmade frames into objects of beauty. The company hopes that they will also serve as reminders that with some creative thinking, nearly anything can be recycled or repurposed.